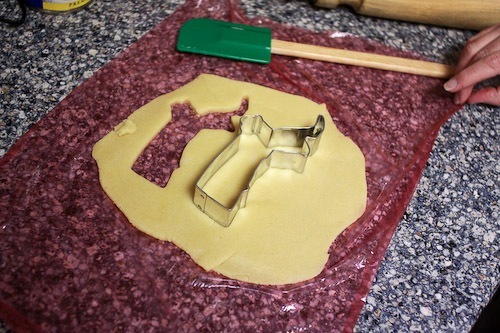 We are both from Massachusetts and not that long ago we bought a cookie cutter shaped like the state figuring it would come in handy one day. Well, for our “Inaugural Ball” we made sugar cookies in the shape of Massachusetts…because, of course, Obama would not have won the election with out winning Massachusetts. It’s definitely a swing state! 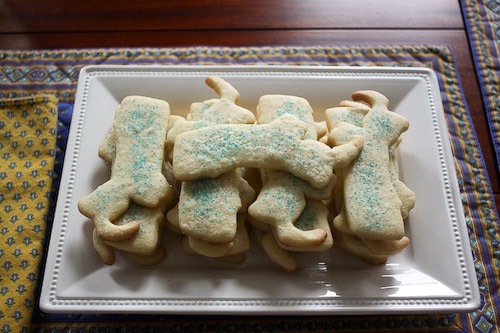 You’ll also notice we used blue sugar sprinkles to decorate the cookies. The cookie cutter worked out good, but getting the Cape area out was somewhat tricky. For the most part the cookies retained their shape, but some turned into blobs. That’s all right…they were all tasty. Working with a stand mixer fitted with a paddle attachment or with a hand mixer, beat the butter at medium speed for a minute or so, until smooth. Beat in the sugar and continue to beat for about 2 minutes, until the mixture is light and pale. Add the egg and yolk and beat for another minute or two; beat in the vanilla. Reduce the mixer speed to low and steadily add the flour mixture, mixing only until it has been incorporated–because this dough is best when worked least, you might want to stop the mixer before all the flour is thoroughly blended into the dough and finish the job with a rubber spatula or spoon. When mixed, the dough will be soft, creamy and malleable. Turn the dough out onto a counter and divide it in half. Shape each half into a disk and wrap in plastic. Chill dough for at least 2 hours. Well-wrapped dough can be refrigerated for up to 3 days or frozen for up to 2 months. When ready to bake, center a rack in the oven and preheat to 350 degrees. Line two baking sheets with parchment or silicone mats. Working with one packet of dough at a time, roll out the dough between sheets of plastic wrap or wax paper to a thickness of 1/4 inch, lifting the plastic or paper and turning the dough over often so that it rolls evenly. Lift off the top sheet of plastic or paper and cut out the cookies. 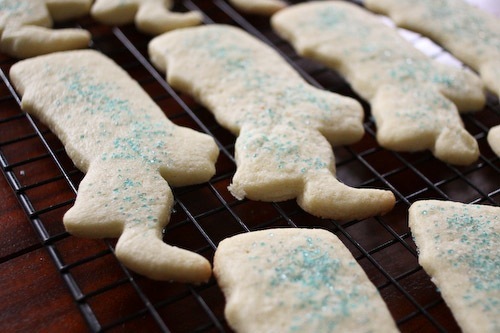 Pull away the excess dough, saving the scraps for rerolling, and carefully place the cookies onto the baking sheets, leaving about 1 1/2 inches between cookies. Repeat rerolling and cutting until dough is gone, chilling dough for about 15 minutes as necessary. Sprinkle with sugar crystals, if using. Bake the cookies one sheet at a time for 9 to 11 minutes, rotating the sheet at the midpoint. The cookies should feel firm, but they should not color much, if at all. Let them rest for 1 minute before carefully lifting them onto a rack to cool to room temperature. Cool baking sheets between batches. PERFECT. Stationed on the Cape with CG right now. Might have to Google this-great idea for a batch of cookies for my friends here. Thanks for your service out on the Cape! Thanks Christine! It is cookie season again so I think we will be giving this another try soon.